This past week marked my fifth year of blogging. How time flies! I am so thankful to have this place where I can share pictures and words, and to have you here reading them. Today I'm celebrating with a giveaway! While contemplating what I have enjoyed using and think you might enjoy using as well, two things came to mind. First off, Four Seasons Pocket Pads by Potter Style. I always like to carry a small notebook in my purse, and these fit the bill beautifully. Their being separated into seasons make them easy to switch out, keeping things interesting. Mine are now full of random lists, numbers, book titles, thoughts, and doodles. And what do you need for writing in a notebook? My pick is The Note-To-Self Seven Year Pen by Seltzer Goods. It writes smoothly and, supposedly, can write 1.7 meters a day for seven years. I've only had mine since December (I had put it on my Christmas list after seeing it on Pinterest), so we'll see. . . Think you or someone you know could use a few notebooks and a pen? To enter, simply leave a comment below or email me at megansa@sbcglobal.net. The giveaway will be open through July 27 at 4:00 P.M. central time. I'll plan on drawing and announcing the winner that night. Notebooks and a pen... A girl after my own heart. 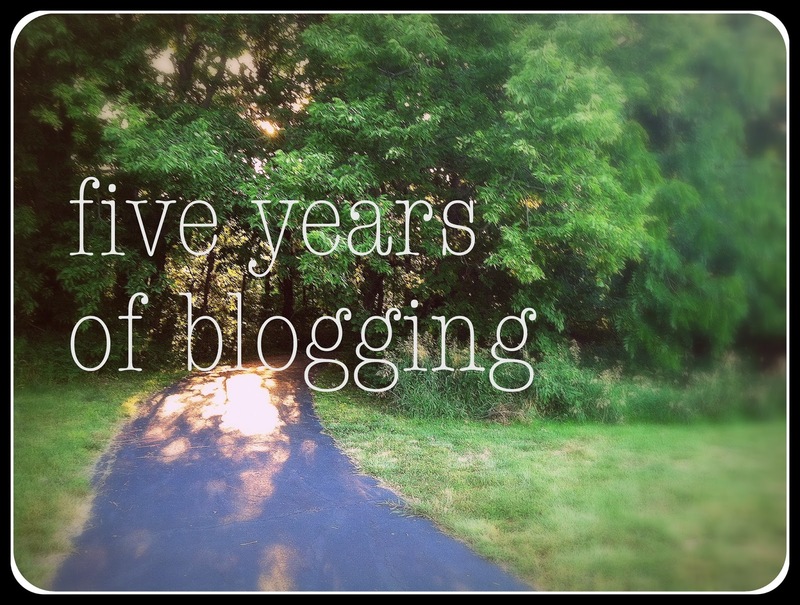 How impressive to complete 5 years of blogging! Congratulations to you. I've enjoyed seeing life through your eyes. Grace and peace to you in Christ Jesus, Megan. Hello Hello, Megan! What a lovely spot you have here. I'm having a 4th birthday giveaway over at my place, Curious Acorn.blogspot Why don't you pop in for a visit?